Made from our soft, buttery brioche dough, baked square 5” to a side. 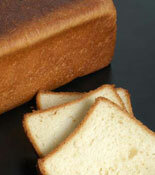 Perfect for thick-sliced French Toast or Texas Toast. Sold unsliced, but also available sliced.